Hang in there Matt. Vehicles break down, it's what they do unfortunately. With the exception of the APU, I'd almost bet your interior lighting issue is something relatively simple. You might want to check the fuse box if you get a chance, as the interior lights normally all run on the same circuit. Thanks, Robert. Road Assist had me walk through the fuses and nothing was out of the ordinary. They're now convinced that there is an electrical short somewhere that is draining the batteries rapidly. The reason the interior lights quit working was actually due to a low voltage disconnect. Prior to rolling out of Olathe, KS on Friday, all of the truck's batteries were replaced, thinking that the old batteries had just failed due to age. Mostly, I'm grateful to be running solo when no other company would give me the chance. My patience did wear a bit thin but I had to remind myself that these situations are beyond anyone's control. Congrats on surviving your first day Matt! What's interesting about this story is that it shows you how challenging an ordinary day is in the life of a trucker. It's a long series of obstacles to overcome and situations you simply have to make the best of. Nothing ever seems quite perfect out there. Your truck will always need a thing or two worked on, the weather & traffic never cooperate for long, the schedules are tight, you're always missing your home & friends, and a million other things. The days are very, very long and most of the time you'll be so exhausted you'll hardly remember going to bed. Overcoming the challenges and keeping that freight moving safely and efficiently is what makes trucking so rewarding. No two days are ever alike and trucking is almost never easy. You've gotta stay on your toes and keep working hard to get the job done out there. That's what it's all about. Thank You Brett. I am ever grateful for the support that this website provides. Well day two has started out very interesting so far. Unfortunately, I have met with partial cab electrical failure. My inverter and APU have also failed completely. At least the tractor diesel starts and on board gauges work and all exterior lights. My DM, Road Assist, and the Load Planners have decided that I'm broke down so another driver just got a sweet 1000 mile run. I'm still at this truck stop at Emporia, KS awaiting further instructions. On the flip side, this job is teaching me so much about life. One concept that I always struggle with is not being able to accept the things that I cannot change. I have always been something of a control freak. With a smile on my face, I am finally learning to just not need to control the situation. I am also learning to deal with setbacks with patience and understanding. This is something I have never really been able to do previously. Based on what I have learned alone, I think everybody should spend time as a truck driver once in their lives. This experience is helping me to grow as a person. Day one as a rookie company driver for Trans Am trucking has come to a close. This day has been one of many ups and downs. The day began with a broken trailer assigned to me. I got coupled to the trailer only to find out that I was unable to raise the landing gear and this was in Kansas heat. So okay, I shrugged my shoulders and sent a message requesting my new trailer and another message to break down to have it repaired. The trucking gods were with me because I only had to drive a short 89 miles today to drop off my empty trailer to be loaded. I successfully made it to the shipper and slid my tandems back like a good boy only to be unable to uncouple the trailer once I dropped it off in the designated space for empty trailers. A Good Samaritan from Tyson Foods came over to give me a few suggestions and we got it on hitched. Then I went ahead and bobtailed to the nearest Flying J truck stop and shut down for the day. After a nap, I discovered that none of my bunk lights are operational even though when I checked the truck out yesterday, all of the lights worked. In light of this, I sent another breakdown message and I learned that I won't be able to get the lights repaired until Monday. Despite these relatively little things, I absolutely love driving down Kansas 35 and taking in the scenery and beautiful blue skies. I am thanking my lucky stars for the friends that I've made in school and at other companies who help to keep me sane and keep my reactions measured. My advice to any new driver is to make use of your cell phone keep in contact with your friends. Oh and I forgot to mention that I left the yard without my king pin lock. So it looks like I will have to purchase one from a truck stop. It is not sanctioned by transam but I have to adapt and overcome. I'm new to the site, and new to the trucking industry. I got my CDL last month, and am headed to Allentown to orientation for Werner next week. Can anyone out there fill me in on what to expect? I had a DOT physical in school. Will I take another one there? What was your experience while in orientation? How are the facilities? How are the driver trainers? Can you let us know how it goes? I'm considering Werner once I get my license. One of my instructors at Smith & Solomon used to run for Werner and he had a great experience. Took my NJ test today, I was so nervous. I passed. My biggest fear was the 90 at Miller, but in dropped in so sweetly. No pulls ups first try. I stalled but recovered it. I need to be in Indiana on Monday for orientation at Schnedier on Tuesday. I hope I have no problems with medical. Congratulations man! You got your license to learn. The only thing I am not looking forward to is the 28hr Greyhound ride. Things I'm concerned about are: The TNT..Living in close quarters with another bloke for, how many weeks? The maneuverability test. Parallel parking (blindside), offset parking, and 90 degree docking. Overall, I think everything will be fine. Very excited! This may sound corny, but the thing I can't wait for the most, is to get my truck, and my first CB radio! Ha! I'm 43yrs old, and I've wanted one of the damn things since Smokey and the Bandit. I understand now, the airwaves are filled with hate and filth, but that seems to be all forms of mass communication these days, ie. the internet, online gaming etc. I've done a ton of research, and am ready to pass the CDL permit, and necessary endorsements. Also, Daniel B's one month adventure, was very addicting, and I thank you. The snowy mountain driving reminded me of my home town of Cleveland. No mountains, but plenty of change in elevation with blizzard conditions. I know what sliding and tires braking away feels, like, and do not look forward to that in an eighteen wheeler. Anyway, I'm so excited, and friends and family can't relate, so thanks for this forum as well. The grey dawg isn't much fun but at least it's a lot more comfortable than it used to be. The Wi-Fi works great. Wishing you all of the best. Finally jumped, with no cord. On the Grey dog July 11th, start on the 13th. Here we go! Wishing you the best man! Sometimes that works but in poorly lit or even dark areas, you may need some idea of distance to your turn. This is something i worry about too. I havent even gotten hired anywhere yet but i worry about what its going to be like when i start solo. I havent really driven anywhere outside the northeast so i figure ill be fine but ive heard too many stories about Qualcomm being wrong and gps being wrong where i wonder how im ever gonna figure out where im going after i leave the interstate. I did worry about this too. I'm thanking the trucking gods that this actually happened during time with my second trainer. We got turned around by a poorly marked road closed sign in rural Ohio and found ourselves lost and on roads not designed to accommodate an 18 wheeler. The road closed sign was on the shoulder and not even in a place that impeded traffic. I over thought this one. The Qualcomm lost both satellite and 3G cell signals. We were flying blind and trainer was nervous. I actually remained calm and rational. I knew the general direction we wanted to go was west. All I had to do was be mindful of a low bridge or bridge with a 3-5 ton weight limit. At one point we got down a road so narrow it was impossible to turn around and a 3 ton bridge came up. Turning around risked a rollover and crossing risked a collapsed bridge. The other option was to drive in reverse nearly ten miles and more serious risk. Clearly a catch 22. So I put my 4 ways on and paced out the length of the bridge. Turns out that the bridge was a little over the length of a pickup truck and 10 ft wide. Safest course of action .... cross the bridge. So at least the bridge would get a rest break between the steers, drives, and trailer tandems. Again, luck was on our side because the bridge held fast! Lesson learned. It's best to treat a road closed sign, even one well off to the side and not even impeding as the gospel truth. Other truckers fell for this too so when we were finally back on main roads, we got on the CB and advised others. What other hurdles have you faced? I've only been solo for seven months, so probably these are normal, but how would I know? There are a couple of recent things I've noticed. For example, at first I was all pumped up with adrenaline to get everything done as soon as possible: get the load on, get to the receiver, get empty, get to the next shipper. I still have the same desire to get there, but I've had a few days where laziness or long-term fatigue or something kicks in, and I'll stop a little earlier than I should. It's not the best attitude. The next day I'm kicking myself for it. Some days it feels like I've lost that edge I had at first. Another thing is missing home. It's a long story, and not very interesting, but I was living away from family for about 9 years, and only saw them once or twice a year. I see them a lot more often now, which was one of the reasons I quit my old job and started driving. The more often I see them, the more I miss them when I'm away. Now I find myself really wanting some home time after about two weeks. When I started, I was out for ten weeks and it was no problem. It's probably a good thing, really, but it makes it a little harder to stay out and make money. I'm definitely thinking of looking for some kind of regional job next spring where I can be home every weekend. Then there's securement. I watch guys with more experience get their loads secured a lot faster than me, so I wonder, am I slow, or just inexperienced? I feel like I should be faster at this point. I am faster than I was at first, but not as fast as I'd like to be. Probably just impatient with myself. The weirdest thing, though, is recognizing that I have little fears or annoyances that nag at me sometimes. I had gotten good at my previous jobs, so I rarely ran into situations where I couldn't come up with a quick solution. For example, I definitely prefer to run west of the Mississippi. I grew up in western Iowa and have lived most of my life west of there, so I'm a lot more comfortable in that territory. When I get a load to Chicago or Pennsylvania or Florida, sometimes I start worrying about all kinds of little things, like getting lost on some crazy eastern road that wanders every direction of the compass and taking a wrong turn and ending up on a dead end in Afghanistan. I don't usually worry about stuff, so it's annoying. I knew when I signed up that I'd run all 48 potentially, but there are five states I haven't been to yet, and I don't really care if I ever get to them since they're all east, but part of me thinks I'd better do it soon or that worrying habit will stick with me. I have kicked the fear of not finding a place to park with a little more experience, so that's probably what I need - more experience. Ask me again in a year lol. Congratulations, Matt. I am glad things are on the upswing for you! Best of luck with TransAm. I am hopefully finishing school in the next week or two and TransAm is on my list. Don't know which way I'll go but maybe I'll see you out there. I hope to see you there, Tom! Like any company, I've heard the good, the bad, and the ugly but my goal right now is simply to build experience as a solo driver. They do have meticulously maintained, late model Kenworth T680 and T700 trucks with APUs, inverters, and automatic transmissions. TransAm has an automatic tandem release to make sliding the tandems much easier and you never have to worry about sliding the fifth wheel because it is welded in place. Each trailer is clearly marked with a yellow line over what they call the meat hole which makes adjusting your tandems easier. It seems like TransAm has done everything possible to make driving easier and more comfortable. The job is difficult enough so I think this is a great way to get started and build experience. They are also a 100% no touch freight company and my recruiter said that there is no longer forced dispatch to New York City. On the flip side, I've heard stories of less miles for company drivers and having loads swapped out from under you but I take much of this lore with a grain of sand. Also, the pay is on the lower side of the coin. I wonder if many people coming into this profession expect to make big bucks in their first year. Just as long as I'm earning more than 25,000.00 a year (my salary as a Security Guard), I'll be perfectly happy. Now, July 7th, please come as quickly as possible. Hey Matt, glad you're back! I hope this works out well for you. I'm a bit of a loner too, though I lucked out and had a good match with an extroverted trainer who understood me pretty well and would back off (usually) when it got to be a bit much. Not sure how much time solo you've had, if any, but the first few months were pretty daunting for me. I've gotten over those hurdles, but now there are new ones. They aren't joking, it's a tough business to break into, so hang in there! Thank you for the fair warning, Bud. You make a good point that things will still be daunting. I really do appreciate your words of caution. Wow, you did have a great trainer! The two trainers I had were like hammers and very, very impatient. In fact, with one, I wanted to slip some Unisom in his drink so he would just shut up and go to sleep - of course, I'd never actually do that. The driving aside, one of the aspects of trucking that appeals to me is the solitude. I can live in my apartment, perfectly comfortably day in and out without having contact with others. That isn't to say life in a truck is the same thing so I'll treat it as an adventure. Congratulations, I am glad to hear things worked out for you. I've heard great things about TransAm. Stay safe out there! It's been a while since I've been on here. I've had many a trial and tribulation getting this far. I was sent home from two companies and quit one. I tried truck and RV Delivery and lost money. I tried working for an expeditor and also lost money. It took me forever plus a day to become able to angle back a semi and I came down with pneumonia which had me down for the count through the end of May to mid-June. Finally, I went through the last of my savings. My problem is my personality is one of a loaner. I function well with brief interactions but being sandwiched in a tight space with a trainer was difficult. 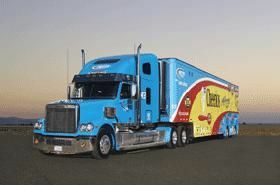 I was just about ready to give up all hope of driving a truck without having to be with a trainer for four more weeks when TransAm reached out to me this week asking me to come back. They admitted they made a mistake with my orientation. When I keft TransAm, I left graciously and with no malice. With all of the combined experiences, I know I can, at least, safely operate a truck. I have plenty left to learn but I can safely learn. Apparently, TransAm agreed as they say I have enough miles of OTR to be a first seat driver. I could have hopped on plane from Exton, PA and given my recruiter a big hug right in Olathe! I don't care if the pay isn't the best, I have gratitude in my heart for having this door of opportunity open up for me. The dispatchers can beat me up, but I will always remember TransAm gave me the opportunity whereas the alternative was working as a security guard whilst figuring things out. I'm bound for Olathe, KS on Tuesday, July 7th for orientation as a first seat, company driver. Will anyone else on TT be headed there? Thanks for reading this. Today I got several emails from Knight. A lot of forms to fill out and send back in, also had to send tax return copies from last two years. Got all that done and I'm scheduled to be in Columbus oh on the 16th for orientation. It's finally happening! Congratulations! Enjoy the journey. There will be ups, downs, and challenges. In the end, it will be very worthwhile! When Brett writes that there will be challenges in trucking, he sure isn't kidding. I'm on my fourth day as a company driver in training at US Xpress. The weather has been awful. Despite the challenges of winter, my trainer has been fantastic. He is clean living and an honest to goodness hard worker. I'm learning a lot from him. Now I need some prayers to go out to him and his family. My trainer's wife is undergoing emergency heart mitral valve surgery so I'm in a hotel waiting. I like my trainer so much that I'll willingly put my training on hold for him because he will make me a good driver. That's worth its weight in gold. Plus, he's genuinely a good, likeable guy. With all that's happened, I've discovered I love this career! I can't believe someone's going to pay me to do this. I can't wait to get my own tractor and start rolling. The camaraderie with fellow drivers is great. Meanwhile, everyone stay safe out there! Thanks Jopa! It took a bit of time for me to develop some confidence on the road. I came from a career in IT where the largest vehicle I'd ever driven was a Ford Excursion. LOL. I'm giddy with excitement and can hardly sleep. As the subject says, it's been a long journey to get my CDL. I began the process last summer through careful research and learning. I tried the company paid training route last November but it was just too fast paced for me. I found Smith and Solomon Driver Training nearby where I live and went to school for 5.5 weeks. I finally obtained my CDL with Tanker, Doubles/Triples, and Hazmat endorsements on February 17, 2015. It was a long and difficult journey with lots of ups, downs, and times where I thought I was just incapable of operating anything but a four wheeler. Well, just last week I attended orientation for U.S. Xpress and was officially hired as a student driver and I'm now waiting for my trainer who is due to arrive tomorrow, March 2nd 2015, weather notwithstanding. I will be celebrating my birthday on the 3rd and on the road as well as the new career. I got a quality education from Smith and Solomon as they not only taught me how to handle the stress of the road but a 34,000+ pound 18 wheel vehicle. I'm also very impressed with U.S. Xpress. They are safety and technology oriented with some of the most modern fleets in the business. My experience with everyone during orientation was welcoming, positive, and encouraging. I'm looking forward to completing my 175 hours of training and upgrading to a First Seat driver. I truly believe I found a home at USX. Finally, last and certainly not least - not in any way - I owe a lot to the trucking truth website for keeping me very well informed. So I couldn't decide what school to with cause EVERY school had its bad according to forums. I couldn't afford to quit my job and travel across the states for school. So I went with S&S! They have a weekend program that works good with my work schedule. Class started on Nov 29th and so far it feels really good! For once I feel like a have a very good chance on passing my cdl permit! I live in the west Chester area of Pennsylvania. Just outside of Philadelphia. So I'm looking for a good trucking company to work for once I graduate and get my CDL's!!! Any help of what company to work for. No flay beds! Looking to do either regional or designated work. Looking into Knight. Are they good? Any other companies that might bE good!! Thanks for all help!!! Hey man, are you at the Norristown campus? I'll be there Dec. 22nd.